Taking Flight: Bald Eagle Caught in "Wolf Cam" is a REGI KID! A few days ago I received an email from DNR biologists Ron Eckstein and Pat Manthey. They had received some photos of a banded Bald Eagle. I band the Bald Eagles released after recovery at REGI, so they included me in a thread of several other folks to identify the leg band. 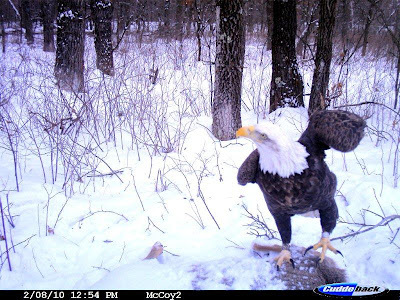 Tim Wilder, serving the military at Fort McCoy, WI sent the following note to the DNR along with several photos of the eagle from his video cam. 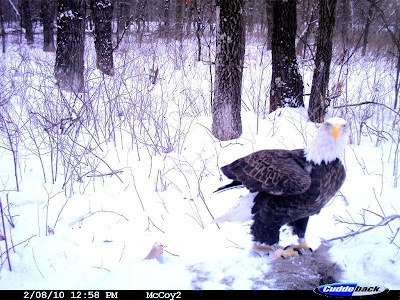 "I thought I would let you know that I got photos of a banded bald eagle. For several years I have been getting wolf photos using a trail camera baited with road-killed deer. Though I normally get a good number of wolf photos – I get hundreds of eagle photos. The other day I got numerous photos of an eagle with bands on each leg. The band on its right leg has the numbers 676 visible in some of the photos – assume that is not all of the numbers. Anyway – thought I would let you know but assume there is no way to track down who would have done the banding and where the bird was banded." Happily, Tim could not be further from the truth. The USFWS is very careful about following all banded or marked birds. Records are kept at the Bird Banding Lab in Laurel, Maryland. If you find a banded bird you can call and report the band number. You will be notified as to when and where the bird was banded and even who banded it. This is true for all kinds of birds from tiny finches to and through Trumpeter Swans and Bald Eagles. We are so lucky that our former patient was identified. This bird has an interesting history: Notes received from Marge at the time indicate that she had received it on 5/26/02 as a 4-week old nestling from “Hwy D Plainfield, WI.” For history she said: “Nest down, erected new nest,but parents gone. 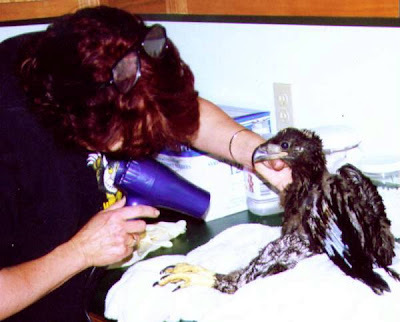 No response ” The eaglet was taken to Raptor Education Group, Inc in Antigo and put with a foster parent Bald Eagle to recover from injured suffered in the fall and until a wild nest could be located for fostering. Eaglet was fostered into a nest containing a single eaglet of matching size at Cisco Lake (Go 03), Gogebic County, Michigan, on 6/05/02. We are always thrilled to receive information on former patients. This was a special day to find that this tiny eaglet survived her injuries but, was raised well at REGI by a foster parent Bald Eagle ( Miriam) and was not imprinted to humans during her stay at REGI. The wild eagles that were given an extra "bonus" chick cared for her well and now some eight years later she is alive, well and very beautiful. Thanks to Tim, Ron, Pat and Sergij for sharing the information with us. Go 76-76-76 and we hope you live many more years and continue to do well in the wild where is exactly where we want you to stay! That is so awesome! Fantastic work! Thanks Susan. They are so inspiring.